Lying about one’s age has become quite unfashionable. These days magazines and newspaper supplements are full of confessional journalism by women in their forties and fifties writing about the miseries of getting older, usually with the naive implication that theirs is the first generation to feel the pain. The writer and traveller Sara Wheeler, approaching her fiftieth birthday in 2011, dreaded the prospect of ‘the frumpy years stretched out like a downhill catwalk’. She was surprised to find half a dozen role models from the nineteenth century, women who proved that there is life after fertility by reinventing themselves in America, land of new starts. Not that Wheeler’s description of Fanny (mother of Anthony) Trollope at 50 is very encouraging: ‘Failing eyesight, night sweats, unplanned micturation, forgetfulness, deafness, weight gain, hairy chin and gravity.’ Mercifully, that’s not what 50 looks like nowadays! And if it is what it looked like nearly two hundred years ago, then Fanny’s adventures are all the more impressive. She trekked indefatigably around America for three years, always in the most uncomfortable circumstances. Then she ‘slunk home with a suitcase of smashed-up dreams and three children incubating tuberculosis,’ wrote Domestic Manners of the Americans, and became a popular bestseller. 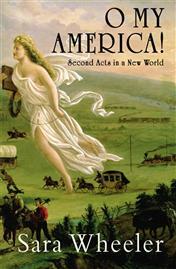 ‘How do middle-aged women respond when life puts the boot in?’ Wheeler asks, and shows us, by describing the American adventures of the revered social commentator Harriet Martineau, and Fanny Kemble, a heroine from a theatrical dynasty who married a brute of a slave owner-driver. It was he who, in drafting a section of the American Constitution, wrote, ‘For census purposes a slave is one fifth of a person.’ Then comes Rebecca Burlend, who dictated to her son an account of her immensely hard-working life and the hardship, grind and disappointments of literally breaking new ground; Jane Austen’s niece Catherine Hubback who went off to California, and the one I suspect is the author’s favourite, Isabella Bird, one of those famous Victorian lady travellers who were invalids at home but miraculously energetic and happy once they were overseas and free. Wheeler weaves her own experiences in with those of her subjects, writing, as in all her earlier travel books and biographies, in a sharp, smart, enjoyable style that combines objectivity with candour. Women still grow up, as Wheeler herself and all her subjects did, with the entrenched idea that female life is more or less over at 50. From the other side of that milestone I find myself agreeing with a great aunt who told me, when I was too young to believe it, that for women, the 50s are the best decade. That’s not quite the lesson that Sara Wheeler has taken in from her six characters. ‘Never give up!’ she exhorts her readers, but her conclusion seems more resigned than optimistic. Women should sail into decrepitude with dignity, like Fanny Kemble, carry on washing the milk pans with Harriet’s vigour, explore with Isabella’s élan, submit to hard work like Rebecca and salvage joy in daily detail as Catherine did. Above all, be deaf to insults. On the streets of Cincinnati strangers addressed Fanny Trollope as ‘old woman’.